Ea O Ka Aina: Is the Deep State for Hillary? Is the Deep State for Hillary? SUBHEAD: The Neocons have failed and Hillary may not be a shoo-in for the Deep State. 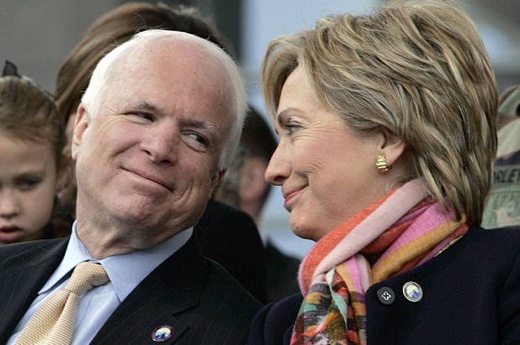 Image above: Senator John McCaine and Hillary Clinton in Neocon lovefest. From (http://www.salon.com/2014/08/30/dont_do_it_hillary_joining_forces_with_neocons_could_doom_democrats/). Maybe Hillary is the Deep State's shoo-in for president. But I suspect doubts in the Deep State have advanced to active sabotage for the reasons noted below. Few would dispute that Hillary Clinton is the Establishment's candidate. It's widely accepted that the Establishment hews to a neoconservative (neo-con) foreign policy that is fully supported by America's Deep State, i.e. the centers of state power that don't change as a result of elections. As a result, it's widely accepted that the Deep State fully supports Hillary Clinton's bid for the presidency and will move heaven and earth to get her elected. While this is a logical premise, I suspect it's overly simplistic. I suspect major power centers in the Deep State are actively sabotaging Hillary because they've concluded she is a poisoned chalice who would severely damage the interests of the Deep State and the U.S.A.
Poisoned chalice: something that seems very good when it is first received, but in fact does great harm to the person/ institution/ nation that receives it. I realize this may strike many as ludicrous, but bear with me as we work through the notion that the Deep State would prefer Trump to Hillary. The consensus view seems to be that the Establishment and the Deep State see Trump as a loose cannon who might upset the neo-con apple cart by refusing to toe the Establishment's Imperial line. This view overlooks the possibility that significant segments of the Deep State view the neo-con strategy as an irredeemable failure and would welcome a president who would overthrow the remnants of the failed strategy within the Establishment and Deep State. To these elements of the Deep State, Hillary is a threat precisely because she embraces the failed strategy and those who cling to it. From this point of view, Hillary as president would be an unmitigated disaster for the elements of the Deep State that have concluded the U.S. must move beyond the neo-con strategic failures to secure the nation's core interests. There are other reasons why elements of the Deep State view Hillary as a poisoned chalice. Hillary is an empty vessel. Nobody seriously claims she has any core beliefs that she would make personal sacrifices to support. While at first glance this may seem to be a plus, the Deep State is not devoid of values. Rather, the typical member of the Deep State has strong values and distrusts/ loathes people like Hillary who value nothing other than personal aggrandizement. Hillary's sole supreme commitment is the further aggrandizement of wealth and power to her family. This makes her intrinsically untrustworthy to the Deep State, which has bigger fish to fry than the Clinton Project of aggrandizing wealth and personal power. Hillary has exhibited the typical flaw of liberal Democrats: fearful of being accused as being soft on Russia, Syria, Iran, terrorism, etc. or losing whatever war is currently being prosecuted, liberal Democrats over-compensate by pursuing overly aggressive and poorly planned policies. The forward-thinking elements of the Deep State are not averse to aggressive pursuit of what they perceive as American interests, but they are averse to quagmires and policies that preclude successful maintenance of the Imperial Project. But the Deep State prefers a leader that can successfully sell the Deep State's agenda to the American public. (President Obama has done a very credible job of supporting the Imperial Project agenda. I think it's clear the Deep State supported President Obama's re-election.) A politician who's primary characteristic is untrustworthiness is poorly equipped to sell anything, especially something as complex and increasingly unpopular as the Imperial Project. Hillary suffers from the delusion that she understands power politics and the Imperial Project. The most dangerous President to the Deep State is one who believes he/she is qualified to set the Imperial agenda and change the course of the Deep State as their personal entitlement. For these reasons, elements of the Deep State might sabotage Hillary's campaign as the greater threat to American interests. Trump is as unpopular as Hillary, but his sense of self-aggrandizement and narcissism is of a different order than Hillary's. Elements of the Deep State may view Trump as more malleable (or more charitably, as more open to much-needed changes in U.S. policies) and a better salesperson than Hillary. Although it's difficult to identify specific evidence for this, the Deep State is not as monolithic as the alternative media assumes. An increasingly powerful sector of the Deep State views the neo-con agenda as a disaster for American interests, and is far more focused on the Long Game of energy, food security, economic and military innovation and a productive response to climate change. Trump is less wedded to the neo-con agenda than Hillary, less concerned with looking weak and more willing to cut new deals to clear the path for U.S. soft power (diplomacy, cultural influence, energy, food security, economic innovation and successful responses to climate change) rather than the neo-con obsession with hard power and the old-style Great Game of geopolitics. Engineer a protracted stock market decline that hits American voters in their pocketbooks before the election by gutting the "wealth effect." A plunging stock market would make a mockery of the claim that the economy is "recovering." Continue to leak dirty laundry on Hillary, her health, the Clinton foundation scams, etc. Put the word out to the corporatocracy, top-level media, etc., that the Deep State would prefer a Trump presidency, despite the widely held assumption that Clinton is the shoo-in Establishment candidate, and that those who cling to Hillary will pay a price later on as the neo-cons are cashiered or sent to Siberia for their failures. Maybe Hillary is the Deep State's shoo-in for president. But I suspect doubts in the Deep State have advanced to active sabotage for the reasons noted above. What would Sitting Bull do? Obama - Kill the pipeline!